Hiring? Toptal handpicks top profitability analysis experts to suit your needs. Are Corporate Responsibility Efforts Profitable? As the argument goes, doing what's best for society is usually at odds with increasing short-term profits. If that weren't the case, then issues of pollution and poverty would have been solved long ago by corporations seeking to maximize profits. "Often, cutting corners, ignoring standards, trampling on communities, polluting, screwing the consumer and working staff into the ground can be profitable." Berkeley professor Robert Reich asserts that we are living in the age of super-competitive capitalism, or "supercapitalism." For the modern firm, Reich argues, long-term earnings are irrelevant, and companies under supercapitalism do not have the discretion to be virtuous. Market value, share price, and risk reduction. 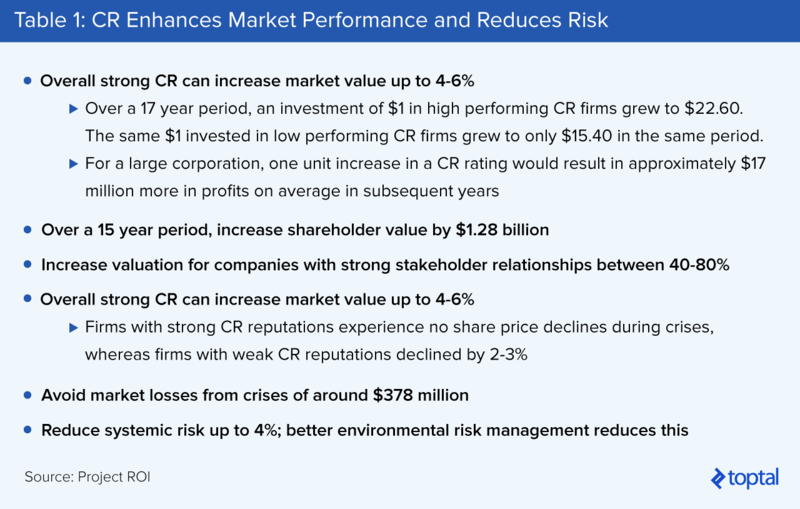 Strong CR can increase market value by 4-6%, increase valuation for companies with strong stakeholder relationships between 40-80%, reduce share price volatility between 2-10%, avoid market losses from crises of around $378 million, and reduce systemic risk up to 4%. Cost of capital reduction. CR has the potential to reduce the cost of equity by 1% and reduce the cost of debt by 40% or more. Potential value for human resources. 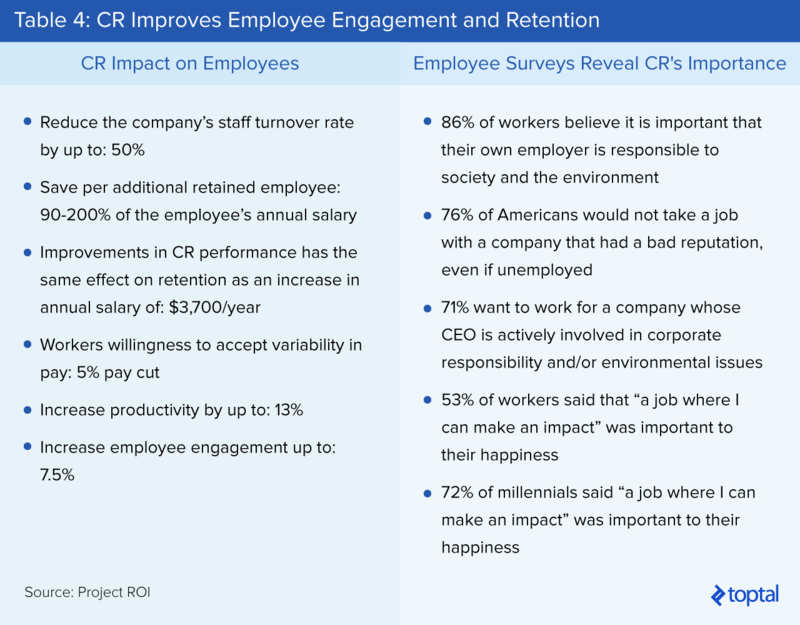 CR has the potential to reduce staff turnover by up to 50%, increase productivity by 13%, and increase employee engagement up to 7.5%. Choose a strategic cause that aligns well with the organization. Make CR commitments that fit your company's core attributes and your key stakeholders' expectations. The payoffs to companies who align CR into their business model are significantly greater than the cost savings for companies who choose to forgo it. Don't launch an initiative just to cancel its effect in another. It's discrediting when your company launches a socially good initiative, only to cause harm in another. For example, Walmart created shared value in their sustainability practices, only to face allegations of unethical business conduct in Mexico. Don't dabble; make a genuine commitment to address CR issues. For a specific CR activity, investors and customers prefer not to have too little or too much; a sweet spot of investment exists. Each company must find the right fit on their own. Measure and quantify. Develop and manage your portfolio of CR practices as if it were an intangible asset. A part of proper management is continuous measurement of quantitative metrics. Multiple frameworks have emerged, including reporting standards bodies such as GRI, IIRC, SASB, and CDP. For more specific guidance, Harvard Business Review suggests this scorecard. For years, a debate has raged: Do corporate environmental and social initiatives drive or distract from financial performance? 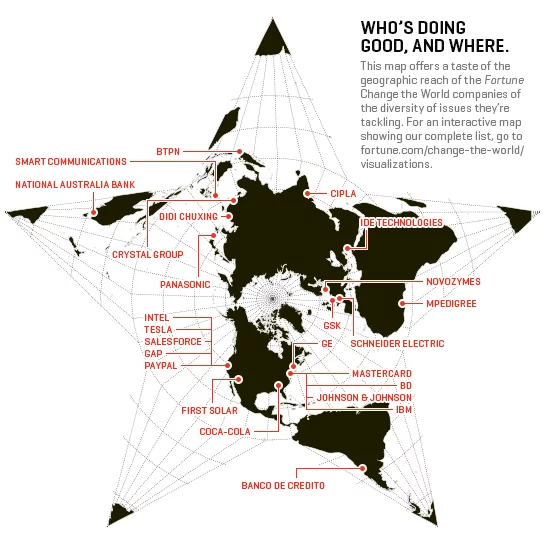 Can companies really do well by doing good? In a famous 1970 New York Times Magazine article, economist Milton Friedman asserted that “There is one and only one social responsibility of business—to use its resources and engage in activities designed to increase its profits.” However, today, corporations are expected not just to create quality products and services, but also to be good global citizens and active participants in developmental debates. This is the case especially as the private sector provides society with 60% of economic output and 90% of jobs. Corporate consciousness is on the rise, though it’s evolved. Companies often tout their own efforts to produce healthier foods and fuel-efficient vehicles, or to conserve resources in their operations. According to management theorist Michael Porter, corporations and their relationship with society have changed. First, philanthropy meant companies doing business as usual and then donating a portion of earnings to good causes. Then, corporate social responsibility (CSR) meant minimizing harm through sustainable, ethical practices. And now with corporate shared value (CSV), Porter suggests that companies can develop products or processes that meet key societal needs while also creating financial return. 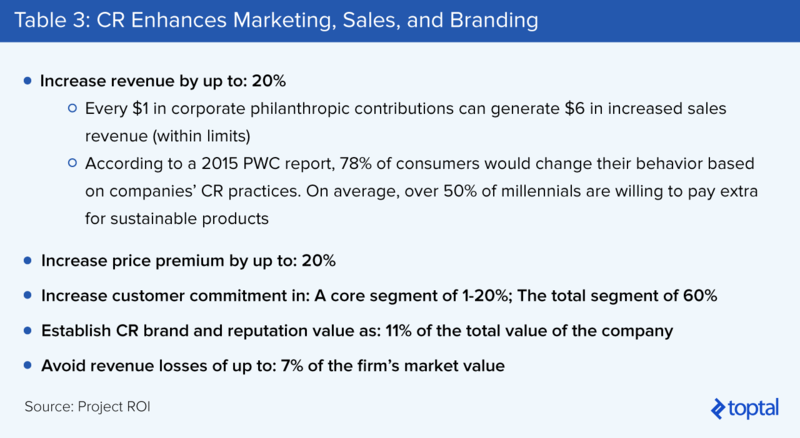 An interesting trend is the designation of B Corporations, organizations that meet a threshold of “impact” and agree that shareholder interests are not the only ones they account for. There are already over 2,000 certified B corporations, including Warby Parker, Unilever, and Patagonia. What, then, are the economics of this increase in conscious capitalism? In this article, we put aside motive—of genuine altruism or self interest—and philosophical debates around moral obligation. Instead, we examine the results of studies around whether corporate responsibility initiatives positively impact profitability, examples of companies that have implemented such measures successfully, and recommendations for those looking to do so. We will refer to corporate philanthropy, CSR, and CSV efforts collectively as corporate responsibility (CR). 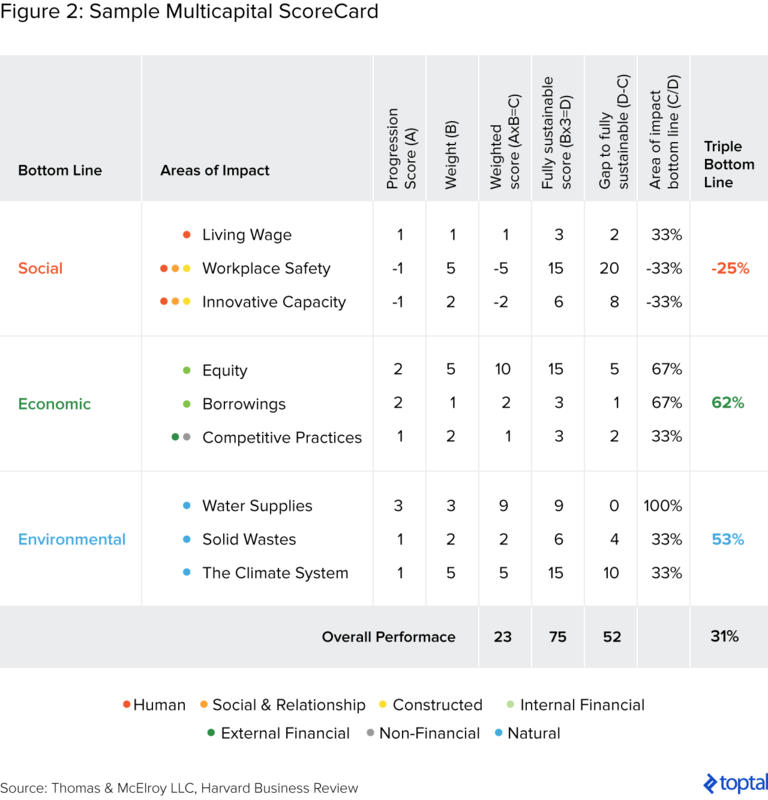 How Does Corporate Responsibility Affect the Bottom Line? There are two major schools of thought on the issue: those who don’t believe in CR’s tangible value, and those who insist that it’s possible for CR to yield tangible benefits. Below, we explore both. Many express skepticism towards the tangible impact that socially good practices can have on businesses. According to an article in The Guardian, “There is indeed evidence that sometimes, maybe even often, the right thing is also the profitable thing. But often, cutting corners, ignoring standards, trampling on communities, polluting, screwing the consumer and working staff into the ground can be profitable too.” As the argument goes, doing what’s best for society is usually at odds with increasing short-term profits. If that weren’t the case, then issues of pollution and poverty would have been solved long ago by corporations seeking to maximize profits. In his paper, “The Case Against Corporate Social Responsibility,” Berkeley professor Robert Reich asserts that we are living in the age of super-competitive capitalism, or “supercapitalism.” For the modern firm, Reich argues, long-term earnings are irrelevant, and companies under supercapitalism do not have the discretion to be virtuous. To Reich, competition is so intense that corporations generally cannot accomplish social ends at a cost to their consumers or investors, as they will simply find better deals elsewhere. 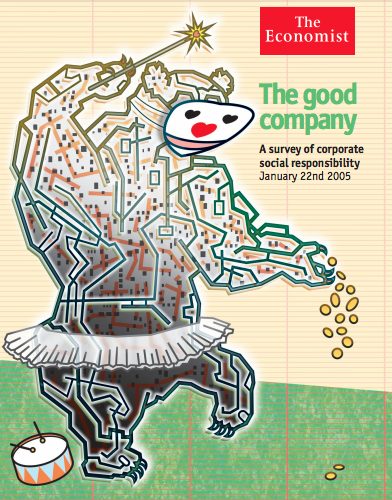 A popular 2005 Economist spread also makes its case against corporate responsibility efforts. The article declares, “most CSR, in fact, is probably delusional, meaning that it reduces both profits and social welfare.” It argues that since almost all efforts have some cost, if those managing the efforts merely go through the motions, delivering no new resources or giving employees and stakeholders no reason to think highly of it, it leads to a net loss of welfare. One can’t deny that CR initiatives don’t always work in practice. Consider Indra Nooyi, Pepsi’s former CEO. Nooyi believed that a shift towards healthier products would be beneficial for both society and for Pepsi’s profitability, acquiring healthier brands like Tropicana and Quaker Oats. However, during her tenure, Coca-Cola’s stock price doubled while Pepsi’s stagnated. Pepsi even lost its number two position in the cola market to Diet Coke in 2010. Consequently, Pepsi eventually announced management changes. Still, there is a growing volume of the data that supports the view that CR efforts yield positive effects. In general, “doing good” can result in cost and risk reductions, a stronger competitive advantage, branding wins, employee retention, and increased sales. Many of the world’s biggest and most successful companies are partaking (see figure below). A meta analysis of 300 studies conducted by Project ROI has concluded that corporate responsibility initiatives have tangible value for businesses. Project ROI statistically analyzed over 300 studies of existing academic and peer reviewed sources, as well as interviews with executives and CR practitioners. The analyses indicate a positive causal relationship between CR performance and financial performance, not just correlation. This central claim is echoed by the OECD, which asserts that “research shows that companies do well by doing good.” A 2004 report that conducted a meta analysis of 52 studies, including a total sample size of 33,878 observations and eventually won the famed socially responsible investing Moskowitz Prize, also supported these findings. Investors are paying attention. They respond to sound CR management practices by viewing CR as an indicator of strong management, competitive differentiation, employee morale, and innovation. According to the 2015 EY Global Institutional Investor Survey, investors are using companies’ nonfinancial disclosures to inform their investment decisions. In a survey of over 200 institutional investors, 59 of respondents view nonfinancial disclosures as “essential” or “important” to investment decisions, up from 35% in 2014. The findings show that CR has the potential to reduce both the cost of equity and debt. A Harvard study corroborates these findings by explaining two reasons why this might be the case: 1) Superior CSR performance captures the firm’s commitment to stakeholders, which can lead to reduced agency costs, transaction costs, and costs associated with team production; and 2) Firms with superior CSR performance are more likely to publicly disclose their CSR strategies by issuing sustainability reports, lending themselves credibility, reducing informational asymmetry, and resulting in lower capital constraints. The quality, management, integration, and communications of your company’s CR approach affects sales and reputation outcomes. If properly aware and engaged, customers will increase their commitment to the company. Consumers, millennials in particular, will trust the brand more and are willing to pay a premium. In fact, Unilever’s “brands with purpose” are growing at twice the rate as others in their portfolio. Research finds that strong CR performance increases the motivation, fulfillment and morale of employees. This increased engagement and CR continually reinforce one another to enhance productivity, financial performance, brand value, and innovation. TOMS is a great example of social entrepreneurship. Its now-famous business model was unorthodox at its inception over 10 years ago: For every pair of shoes a customer bought, TOMS would donate a pair to a child in need. TOMS is a for-profit organization, and was recently valued around $392 million. CEO Blake Mycoskie said the average retail price for a pair of TOMS is $55, while the notorious canvas shoes cost about $9 each to manufacture. According to BCG research, 50% of their customers are aware of and motivated to buy based on the element of social good. In 2014, Bain Capital acquired a 50% stake in TOMS and will continue the one-for-one business model. GSK is a pharmaceutical giant looking to serve not just wealthy nations but also citizens of emerging countries. The company spent three decades developing a vaccine for malaria, which has ravaged much of sub-Saharan Africa. GSK has also partnered with the government of Botswana on an ambitious HIV treatment program. GSK prices drugs on the GDP of the 150 countries where it does business—and in dozens of the least developed nations, it reinvests 20% of profits in local health care infrastructure and worker training. Significantly, GSK makes money—nearly $16 billion in total operating profit in 2015. In 2008, IBM launched their Corporate Service Corps program. As part of the program, 500 IBM employees every year bring their core competencies in project management, strategic planning, or engineering to an entrepreneurial company based in an emerging market such as Brazil, China, or Ghana. IBM Corps teams tackles issues ranging from public safety to urban agriculture. IBM states the program produces a $600 million return on a $200 million investment. While the regular staff turnover rate is around 12% per year, the rate for employees in the Corporate Service Corps is less than 1%. The company also highlights benefits such as talent attraction—the program is the third most influential factor; skills and competency development; and new market creation. Choose a strategic cause that aligns well with the organization. Make CR commitments that fit your company’s core attributes and your key stakeholders’ expectations. According to the Federal Bank of St. Louis, the payoffs to companies who align CR into their business model are significantly greater than the cost savings for companies who choose to forgo it. These companies generate higher perceived value and buying intention, whereas unrelated efforts may decrease sales volumes. Don’t launch an initiative just to cancel its effect in another. This might seem obvious, but it becomes discrediting when your company launches a socially good initiative only to cause harm in a different area. For example, Walmart created shared value in their sustainability practices improving fuel efficiency by 87% between 2005 and 2014, only to face allegations of unethical business conduct in Mexico. Don’t dabble; make a genuine commitment to address CR issues. The market seems to respond positively to severe laggards with overall poor CR performance, but it responds even more positively to those that achieve high levels of CR. However, the market tends to punish those companies it perceives as putting forth a half-baked effort. For a specific CR activity, investors and customers prefer not to have too little or too much; a sweet spot of investment exists. It’s important to note that there’s no standard level of investment. Each company must find the right fit on their own. Measure and quantify. Develop and manage your portfolio of CR practices as if it were a valuable intangible asset. Companies and their managers are able to exert some choice and control over the benefits that their CR initiatives will deliver. 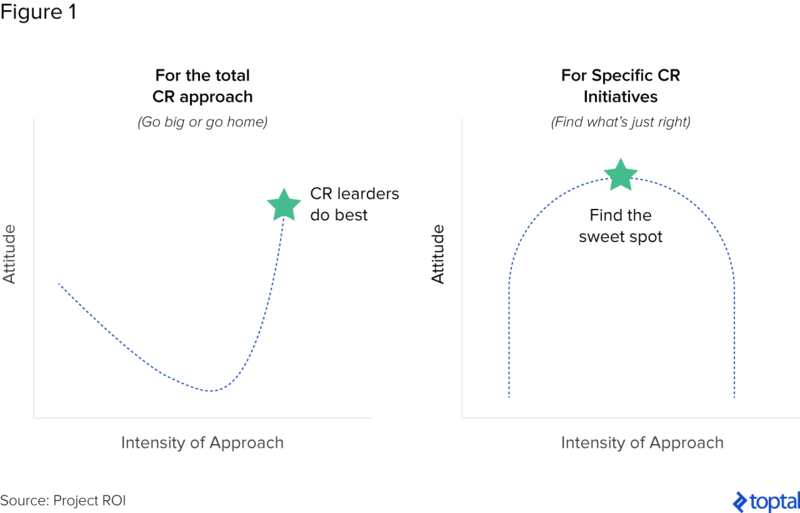 Companies should develop business-aligned and integrated CR strategies. A part of proper management is continuous measurement of quantitative metrics. Multiple frameworks have emerged, including reporting standards bodies such as GRI, IIRC, SASB, and CDP. For some more specific guidance around what a multicapital measurement system might look like, Harvard Business Review suggests the below. It’s true—profit and public interest do not always align. It’s also true that corporate responsibility makes for good public relations and that initiatives aren’t always effective or profitable. It would be difficult for all companies to prioritize solving for prevalent societal issues over efficient business operations. Still, this doesn’t detract from the fact that these programs and goals can work, especially when operational and socially good goals converge. Ultimately, it’s crucial for individual organizations to conduct analyses around what initiatives could be strategic, value-add, and will be lauded by stakeholders, customers, and employees alike.